TechCrunch has received a response from Facebook to the Electronic Privacy Information Center’s letter urging the US Federal Trade Commission to investigate Timeline for privacy violations. Facebook says it has not violated user privacy or its November settlement with the FTC. That’s because Timeline simply makes historic content more accessible, not visible to anyone who couldn’t already see it. Also, Timeline provides Activity Log for managing the visibility of this content. I agree. Facebook may be bending the rules of privacy, but it hasn’t broken them. Maybe ‘applauding’ goes a bit far, but privacy critics should be satisfied that Facebook has paired easier access to content with better ways to manage it. Before Timeline launched, to reach years old content one had to click the “older posts” button over and over. Profile owners were unlikely to go to this trouble, but someone intent on running a background check or defaming them might do so. In this way, the “privacy by obscurity” that EPIC says Facebook has violated may have been more dangerous than helpful to users. 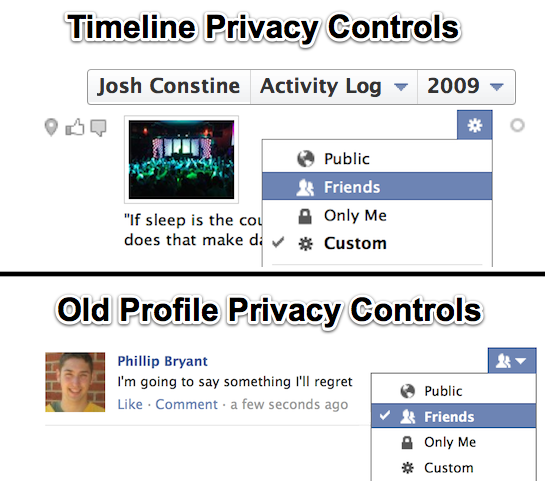 The critical clause of Facebook’s FTC settlement is that it agreed to “obtaining consumers’ express consent before their information is shared beyond the privacy settings they have established.” The fact is that migrating to Timeline does not change one’s privacy settings. Anything set to friends, friends of friends, public, or a custom setting stays that way. Therefore, EPIC’s claim that “Facebook is changing the privacy settings of its users in a way that gives the company far greater ability to disclose their personal information than in the past” is simply false. I’m a big advocate for users combing their Timeline for embarrassing content they might wish to remove. If the FTC wants to make a recommendation about Timeline, it should ask Facebook to more actively encourage use of Activity Log. But ultimately, it should see past EPIC’s sensational claims and conclude that Timeline does not violate user privacy.